I'm so excited! Did you catch my announcement on Instagram the other day? It's time once again for the nail biting, exhausted laughter inducing One Room Challenge! 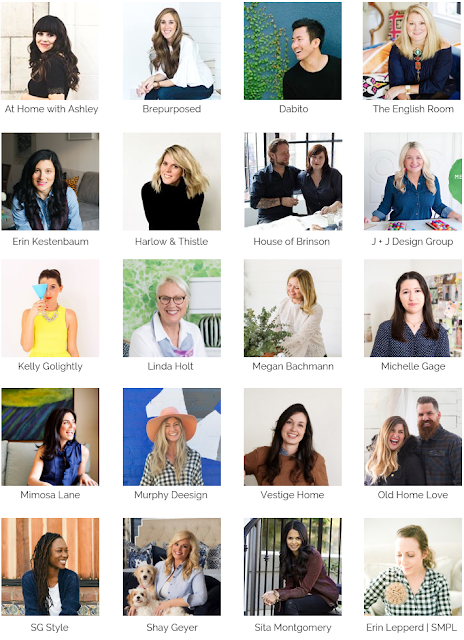 And this one is particularly exciting for me because I have been selected as one of the twenty Featured Designers! Seriously guys this is a bucket list kind of moment for me so please bear with me as I let out the occasional squeal throughout my posts. A huge thank you to Linda of Calling It Home for creating this event and asking me to be a part of the One Room Challenge Fall 2018 edition. It is an honor to be included with this talented group. If you are new here, welcome, I am Andrea, thanks for stopping by! 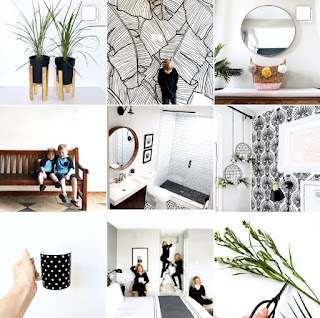 A few years ago I left my corporate job to raise my two young boys and pursue interior design/design blogging full time. 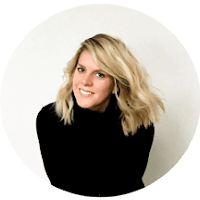 I love sharing new ways to create lux for less in your home and life (and I have a few projects up my sleeve for this One Room Challenge that do just that). As background, I have done the One Room Challenge three times as a guest participant, the first was my living room/dining room, the second was my laundry room and the third was my office (which was my fave). 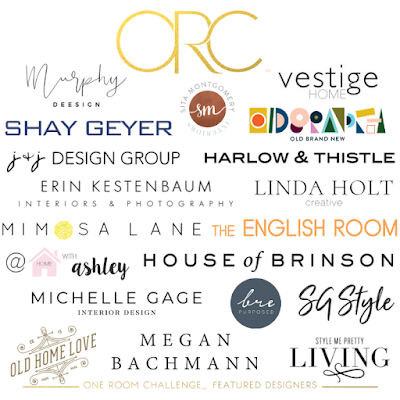 For those of you who may not know of the ORC, it is a design event hosted by the wonderful Linda of Calling it Home that takes place twice a year (Spring and Fall), where designers have six weeks to makeover one room in their home and blog about it along the way. 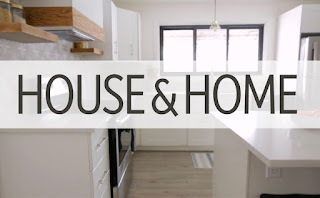 This past summer my husband and I moved into a cute little reno project while we search for our dream home (and with all the love we're putting into this reno project it may end up being our dream home afterall). 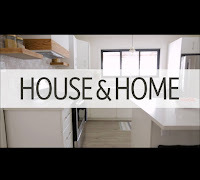 We've already started to transform the bathroom and bedrooms but we haven't tackled the major rooms like the Kitchen or Dining room yet which is why I thought it would be the perfect project for the One Room Challenge Fall 2018. Here are a few more before pics of the kitchen and dining room. 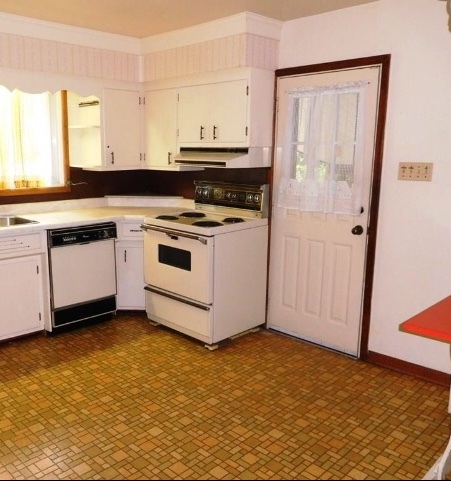 It's a mid-century time-capsule and I love it's charm and potential (my husband uses other words to describe it). Let me know what you think in the comments below - please tell me I'm not the only crazy one who sees a diamond in the rough. We were able to get a head start on the demo. During the demo, I got mad at my 5 yr old son to "stay out of the kitchen!" he just looked at me confused and said "Where is the kitchen?" Here is a glimpse of my high level plans. I'm feeling a little mid-century, rustic revival (that's a mouthful). Special thanks to my sponsors; Shaub and Company, Article, Hayneedle, Hudson Valley Lighting and Blanco Sinks. 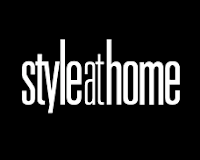 I'd also like to thank Better Homes & Gardens for being the media partner for this event. Be sure to follow me on Instagram to stay up to date on my progress and fun quips. Stay tuned next week as we will be installing new floors and hopefully cabinets (I know, ambitious). Oh yes and don't forget to check out the rest of the featured designers (linked below). I can't wait to see which rooms they've selected and follow along as they transform it. Love, love your concept! And I can't wait to follow along! Thank you! I love that you're doing a sophisticated play room - such a unique (and needed) concept! 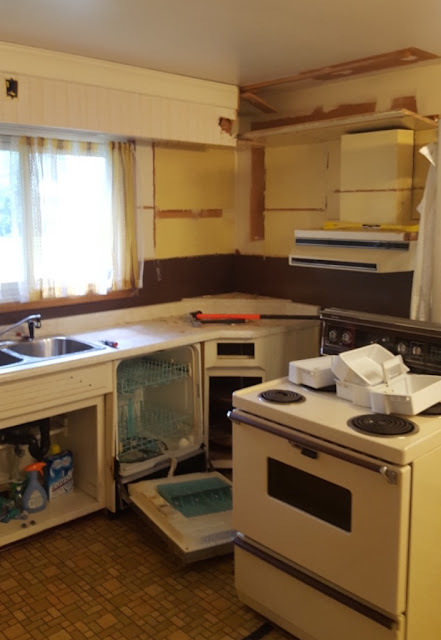 I'm excited to see your progress as I'm doing a kitchen too. I'd love to do the morning room that is attached, but I don't want to be over-ambitious with this being my first ORC. Anyway, your room looks fabulous. I love the vibe of the space and can't wait to see what you do with it. Andrea, I'm so thrilled to see that you're one of the 20 featured designers!!! Congrats! Your kitchen has a ton of potential; you're not alone, I see it too, it's totally a diamond in the rough. It's going to look amazing at the end of this challenge! Thank you Lesley! I'm so excited too! Are you participating? I suppose creating a human being is enough of a challenge eh? lol Hope you're doing well! Home stretch mama! Totally loving your plans!! Can't wait to follow along! I cannot wait to see the transformation. Glad someone else is doing a kitchen. This will be an exciting 6 weeks for us all! haha right!? Kitchen's are scary in this timeframe - we've got this! Can't wait for this transformation! Kitchens are such a challenge on a tight timeline, but I have no doubt you'll pull this one off beautifully! haha so true. I hope I don't regret it like I did my laundry room a few years back lol. Loving your plans as well! A kitchen?! You're so brave! Those plans are to die for! Good luck- this'll be so fun to follow along with! Thank you! I know, a kitchen is crazy in this timeframe. Although it's the motivation I need lol. Thank you for your support! 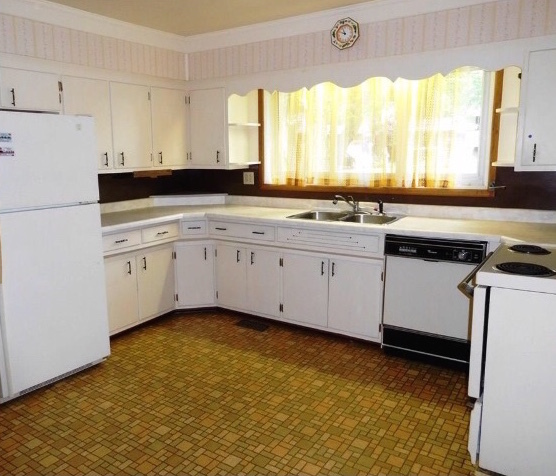 Wow, this looks very similar to my childhood kitchen. Can't wait to see you transform this space. Hang in there. haha totally. It was a timecapsule. Thank you for your support!